Our Year at The Fahm: We All Celebrate in Different Ways! We All Celebrate in Different Ways! THIS is what can happen during a long, dreary winter, so BE CAREFUL. 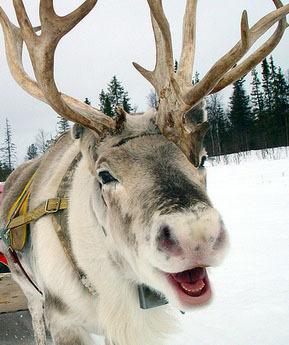 According to Pharmaceutical Journal in an article by scientist Andrew Haynes: "Reindeer deliberately seek out the mushrooms to escape the monotony of dreary long winters...They have a desire to experience altered states of consciousness...For humans a common side-effect of mushrooms is the feeling of flying, so it's interesting the legend about Santa's reindeer is they can fly."